Tax-Credit for Hollywood, not students? 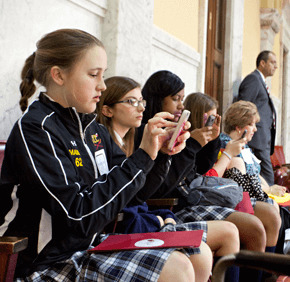 ANNAPOLIS – Catholic school students from the Archdiocese of Baltimore rallied with students from other private schools March 27 in Annapolis to bolster support in the General Assembly for a tax credit that would encourage business donations to public and nonpublic schools. The event included visits to state lawmakers and rallies at Lawyer’s Mall outside the State House. The “Partnership for Student and Community Investment Tax Credit”(SB 844/HB 1216), would allow businesses to receive credit on their state taxes for donations to organizations offering financial assistance to children attending nonpublic and public schools. The credit would be capped at $15 million, and it would not reduce public school funding, according to the Maryland Catholic Conference, which advocates for public policy concerns on behalf of the state’s Catholic bishops. The bill is awaiting action from the Senate Budget and Taxation Committee and the House Ways and Means Committee. Maryland currently offers more than 20 tax credits, which incentivize programs ranging from bio-heating oil to work-based learning. In a statement, MCC associate director Ellen Robertson pointed a finger at the $22.5 million tax credit bill to support the Hollywood film industry that the Senate passed March 23. “Why is financial priority in Maryland given to filmmakers while an important piece of legislation that would greatly enhance the educational future of our children is being ignored?” asked Robinson, who oversees education and family life public policy issues for the MCC. “The children who would benefit from the Maryland Education Credit bill are from low-income families. The glamour they seek from the state of Maryland is a priceless diploma. Their field of dreams starts with a top-quality education, but the General Assembly won’t even let them out of the dugout,” she said. Thirteen students from St. Mary’s Catholic School in Annapolis and nine students from St. Louis School in Clarksville attended the rally, along with other students from Catholic, Christian, Jewish, Muslim and other nonpublic schools across the state. According to the MCC, nonpublic schools save Maryland taxpayers more than $15 billion per year. “Spending $15 million to save $1.5 billion makes sense – especially in these economic times,” the MCC said in a statement.